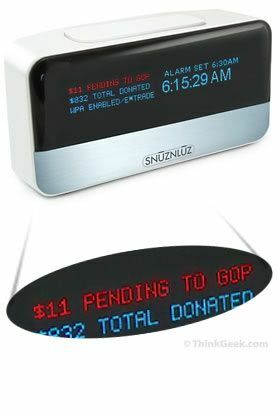 The SnūzNLūz wifi donation alarm clock connects to your online bank account and donate money to an organization you hate every time you hit the snooze button. Yikes!! While it seems a bit excessive to need something like this to get out of bed, it's a really cool idea. Just pick your most hated charity, set up your account for SnuzNLuz, and tell it how much to donate every time you hit the snooze. I'm sure you'll think twice before hitting snooze yet again every morning. ThinkGeek has some great suggestions for donation pairs, too. For example, if you're a butcher, donate to PETA. If you're a hippie, set it to donate to the American Coal Foundation. Check out the others, too. I can see two possibilities with this. Either it will cause people to get up rather than sleeping in, or it will give them an excuse to sleep in under the thinly veiled guise of donating money to charity.